"Aerial view of the curved wall of the amphitheatre"
Behold the 1900-year-old remains of Emperor Trajan's personal theatre. 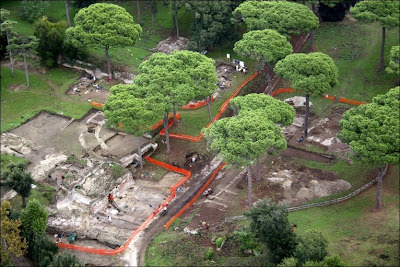 British archaeologists have unearthed a Roman amphitheatre the size of the Pantheon at the site of a port which once supplied Rome and its legions. In the 2nd century, Portus was a gateway to the Mediterranean. Twice the size of Southampton, it now lies two miles inland, close to the runway at Fiumicino airport. The site was first excavated in the 1860s, but after two years of digging, an elliptical theatre has been found which held up to 2,000 people. Its design suggests it was used by a high-status official, possibly the emperor himself. More photos from BBC here.